“This is a brilliant golf course…probably the best that I’ve played anywhere in Asia. Clearly I have a score to show for it,” said Sujjan Singh of India as he saluted the immaculate conditions and layout at the Jack Nicklaus-designed Taman Dayu Golf Club in East Java. 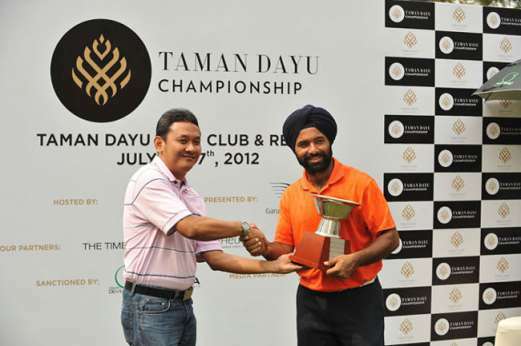 Singh wowed members and spectators over the four days of the Taman Dayu Championship in July, firing a blistering round of eight-under-par 64 to set a new course record in the very first round. The following day he did even better, rewriting the day-old course record with a career-best score of nine-under-par 63 to extend his lead by nine shots. Singh’s two-day total of 17-under-par 127 was also a new record on the Asian Development Tour (ADT), replacing the previous record of 13-under-par 131 set by Siddikur at the 2011 Grameenphone Bangladesh Masters. He edged closer to the finishing line on Day 3 after shooting a third round five-under-par 67 for a massive 10-shot lead. Singh finally completed a sensational wire-to-wire victory with a closing even-par 72, and dedicated his win at the Taman Dayu Championship to his newborn daughter. “I just welcomed a baby girl in May and you start to feel that golf is not everything. That kind of eases the pressure and it worked for me this week,” said Singh, who wonUS$13,125. Singh’s 10-shot advantage going into the final round never looked threatened as he cruised to a first victory outside of India with a 22-under-par 266 total at the majestic Taman Dayu Golf Club and Resort. Australians Michael Moore and Anthony Choat battled to a 66 and 68 respectively to share second place with Filipino veteran Antonio Lascuna (68) on 272, six shots from the champion Singh, at the inaugural US$75,000 ADT event. Michael Moore of Australia, playing in his second year on the ADT, was delighted with the mixture of challenging holes. “This golf course is fantastic. It is a pleasure to play on it. There are holes out there where you can’t attack and there are some where you have to be patient and wait for the opportunities,” he said. Filipino Lascuna, who equalled the course record of 63 in the third round, was delighted with his finish where he birdied the last hole in front of a cheering crowd. “It was good fun and I’m not disappointed with how I finished. Singh had a huge lead and it was tough to chase him down. All in all, I enjoyed this tournament. The course was fantastic and the tournament was well run,” said Lascuna, an Asian Tour regular. The Taman Dayu Golf Club and Resort is located in the resort area of Prigen, East Java, within a one-hour drive from Surabaya.